I am at risk of bragging, but I think I’m good with mechanical things. And, I generally enjoy working on the boat’s systems. Our Sanctuary occasionally offers up the chance to work on her, sometimes in “exotic places” (Ahh! The definition of “cruising,”) Following is a list of hand tools I find useful. Specialty items are listed in red. I find the specialty items incredibly useful, if only used occasionally. For the tasks they are good at, such as accessing a bolt head in a very limited and tight space, there is nothing else that will do the job. I suggest the reader use this list to assess personal hand tool requirements. If not a DIYer, a small subset will do. With these tools, many DIY projects are possible. 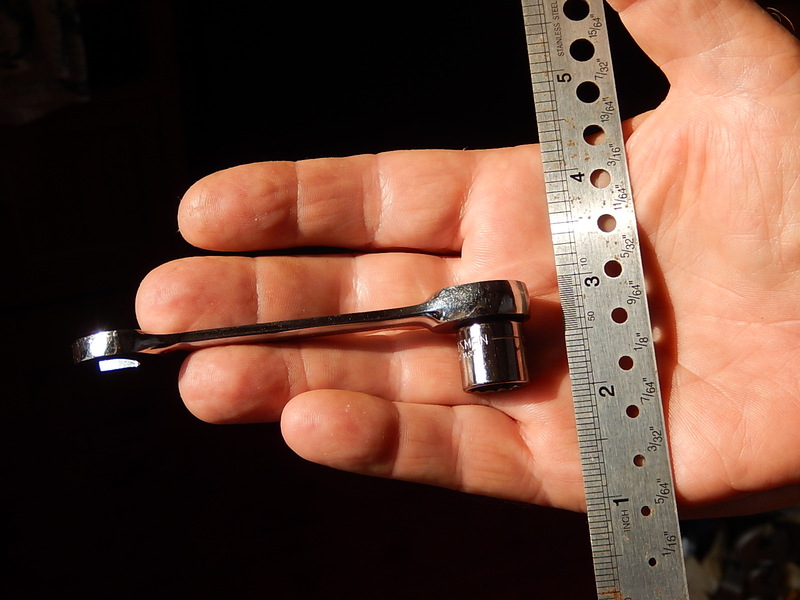 Here, for example, is a photo of the Sears hex socket in a GearWrench stubby ratcheting combination wrench. It is the only combination of tools I know of that allows me to remove the cover on my raw water pump without pulling the entire pump off the engine boss. The Craftsman 3/8″ deepwell socket set I mention has the only socket that is both the right size and is physically short enough to fit onto the fuel shutoff solenoid on a Cummins 4B/6B injection pump without having to pull the pump off the engine. So I grant, these are not tools that will be used every day, but when they’re are needed to do a job, nothing else will do. This entry was posted in Hand Tools on 2014/08/21 by gilwellbear.